Regular wash downs are just a start to our monthly maintenance programs. 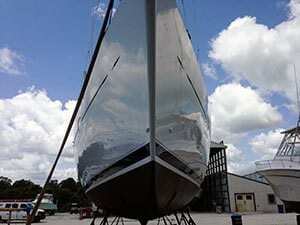 Ongoing maintenance is necessary to preserve your boat. Yachting Magazine explains this concept well here. Our custom programs provide individual attention to your boat. We help maintain your investment. This service is tailored to your individual needs and budget. Our team keeps you informed about your boats’ condition. We address any needs promptly. We remind you to schedule larger services such as waxing and varnish work when necessary, before issues arise. Ask us how much a monthly cleaning program is and we think you’ll be surprised. As a boat owner you want to show up to a clean boat. We believe you should enjoy your time boating not cleaning. Spending hours washing before you head out is not the fun you had in mind. Enjoy your boat without the burden of cleaning. We address: salt residue, scuffs, nonskid, dirt, mildew, bird staining, pollen, isinglass, canvas and stainless. Interior service available: carpet cleaning, engine room, head and galley cleaning. Common schedules include: weekly, bi-monthly, and monthly. We provide on-call service immediately upon request. Routine cleaning and polishing will provide long term protection from the elements. On-call service is also available. Maybe you have guests visiting or are planning a last minute day trip. We can tidy up for you. Many boat owners prefer this service when selling or immediately after purchasing a new vessel.